A new AV delay measurement option will be on display in the Phabrix 2019 NAB Show exhibit. Any active processing equipment can potentially introduce AV Delay, but compensation for delay may only be possible as a system solution, not on a unit-by-unit basis. Phabrix recently announced a new AV Delay Generation and Analysis option for its handheld SxA, SxD & SxE instruments. The option offers an end-to-end solution for the measurement of Audio to Video differential delay through a broadcast system. SDI carries both video and audio data but it does not mean that the video and audio are correctly in-sync. Referred to as a Lip Sync Error, or AV Delay, the results can sometimes create a noticeable issue for the viewer, especially in broadcast workflows where feeds are encoded. Understanding the accumulated AV Delay through a broadcast system is an engineering priority. The new AV Delay option provides a real-time update of the differential delay between the video and the selected audio channel pair. 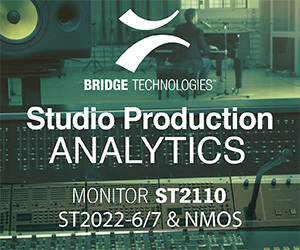 It has the ability to measure the propagation or pipeline delay of either video or audio and supports all Sx video formats and frame rates on SDI and AES interfaces. The AV Delay Generator produces an adapted EBU Tech 3305 AV Sync ‘clapperboard’ Test Pattern. This is compatible with third party AV delay analyzers such as the LAWO V_pro8. The AV Delay Analyzer supports measurement of two AV Delay test patterns; EBU Tech 3305 and LAWO V_line AV Sync test pattern.